I’ve lived in California almost 14 years now, but there are certain American pastimes I will never fully understand. Camping (gasp!) is one of them. And…I’m a little afraid to say…football is another. That may be not be the most popular thing to confess, but hey, it’s not like I started a food blog to make friends. Football in this country confounds me. The bizarre name for a game where your feet almost never touch the ball, the aggressive physicality, and the fact that really…for the life of me, I can’t understand why no one seems to move more than ten feet without getting slammed into by another player, and somehow, its called a play, analyzed from a thousand different angles, and followed by a commercial break. So you can see why, with all of my issues, I have no choice but to host a Superbowl party almost every year. I like all parts of this event except when there’s an actual game happening. The ads can be really great. The halftime show is a total fun spectacle (Beyonce and Bruno Mars killed it last night! I hear Coldplay was there too). Best of all, I get to try out some new recipes on an unsuspecting crowd. And there’s no nachos or seven layer dips in sight. This platter of roasted deliciousness was my slightly unorthodox opening act for our Superbowl munchies last night. It was probably also the best received, and deservedly so. Why had no one ever told me that butternut squash and tahini are a marriage made in heaven? And sneaky red onion is the true star, in a way that won’t make sense until you actually taste it. I can see myself eating nothing but a bowl of this for dinner on a weeknight, and it’s easy enough that you can, too. The only ingredient that may not be in your spice rack already is za’atar, but once you’ve tasted it, you’ll find ways to use this amazing blend again and again. Preheat the oven to 475 degrees. Put the squash and onion on a large baking sheet, add 3 tablespoons of the oil, 1 teaspoon salt and some black pepper and toss well. Roast in the oven for 30 to 40 minutes, until the vegetables have taken on some color and are cooked through. Set aside to cool. To make the sauce, place the tahini in a small bowl along with the lemon juice, water, garlic, and 1/4 teaspoon salt. Whisk until the sauce is the consistency of honey, adding more water or tahini if necessary. Pour the remaining 1 tablespoon of oil into a small frying pan and place over medium-low heat. Add the pine nuts along with 1/2 teaspoon salt and cook for a few minutes, stirring often, until the nuts are golden brown. Remove from the heat and set aside. To serve, spread the vegetables out on a large serving platter and drizzle over the tahini dressing. 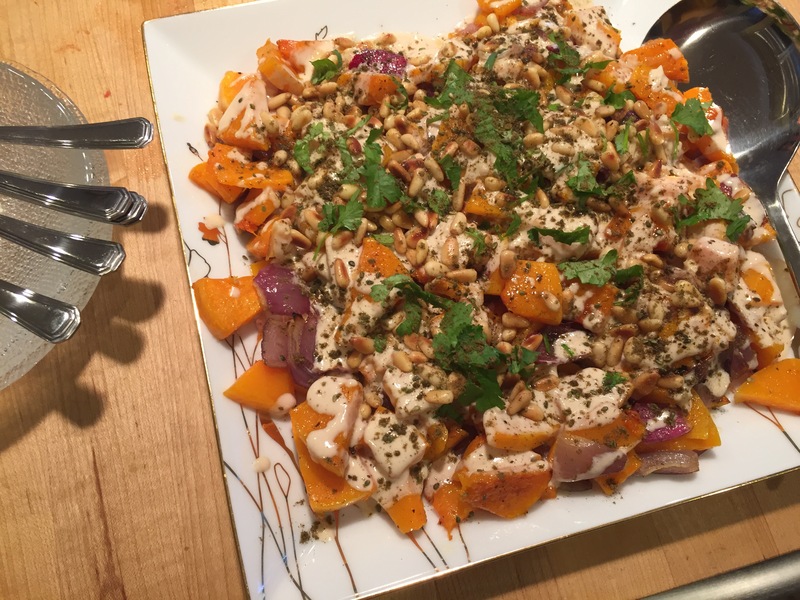 Sprinkle the pine nuts and their oil on top, followed by the za’atar and chopped cilantro. Dig in. Let’s be clear about this. If you’re looking to make these for a crowd, to serve with cocktails, or to give away as party favors, please do the right thing and double this recipe. Don’t be an idiot, like yours truly, who foolishly thought a pound of nuts sounded like “more than enough” to make everyone happy. 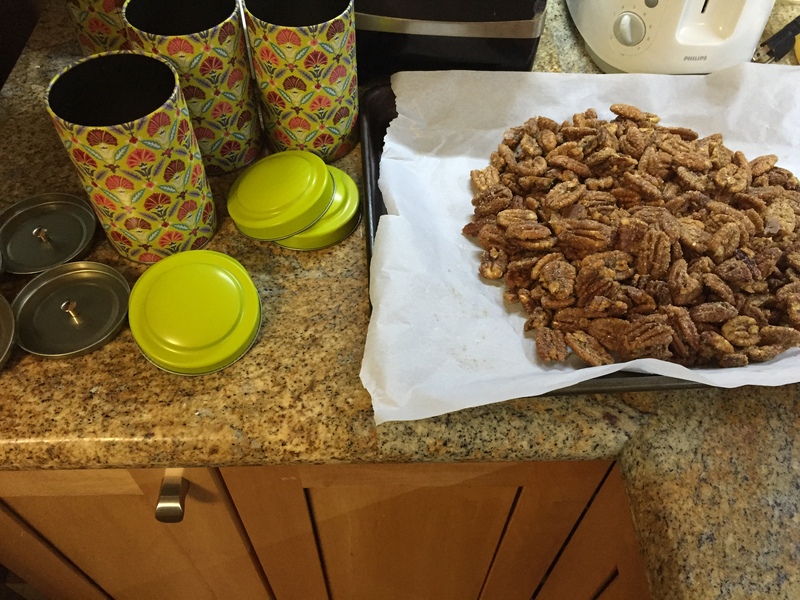 And who wound up with a sad little ziploc bag of insanely good spiced pecans (all that was leftover after I was done portioning out the rest into cutesy tins for our guests, and please, let’s not even pretend that I didn’t sneak a few out of each tin to pad our own paltry supply) that we polished off in…oh, I don’t know…eight minutes??? Anyway, like I was saying, your story doesn’t have to have a sad ending. Just do as I tell you and go to Costco and buy a mega bag of your favorite nuts – it doesn’t have to be pecans. Prep your mix of sugar and spices and coat your nuts of choice in the whole glorious mess. Roast. Eat. Pretend to walk away. Eat some more. Innocently wander past the tray cooling on the counter and blister the roof of your mouth as you nonchalantly pop a few more. Rinse and repeat. Forget your dreams of tossing these with a bright, crunchy spinach salad. Instead, keep your expectations realistic and just try to save a few for the big tupperware box you were planning to store them in. Preheat oven to 300 degrees. Mix sugars, salt, cayenne, paprika and cinnamon, making sure there are no lumps; set aside. Beat egg white and water until frothy but not stiff. Add nuts, and stir to coat evenly. Sprinkle nuts with sugar mixture, and toss until evenly coated. Spread nuts in a single layer on a cookie sheet fitted with parchment paper. Bake for 30 minutes, stirring occasionally. Remove from oven, and separate nuts as they cool. When completely cool, break up any that stick together. Attempt to exercise self control as you transfer them to an airtight container. I have an adult cooking crush on Yotam Ottolenghi. I’m almost hesitant to call it a crush, lest you think this is some kind of juvenile, fleeting thing. It’s a legitimate, serious, long-term obsession. I’ve sung his praises elsewhere on this blog, bought all of his cookbooks, and even plotted future trips to London just to go worship at his many namesake deli/restaurants. If all this sounds a bit ridiculous and extreme, clearly you’ve never tried his food. Because to make just a single Ottolenghi recipe is to fall head-over-heels in love with his genius. The flavor combinations are unusual bordering on outrageous (yes, the recipe that follows this gushing intro does in fact combine cauliflower with sesame seeds, turmeric, basil and eggs in a single breath). The guy has a penchant for bold spices and big glugs of odd ingredients. And there is that huge moment of self-doubt every time you make his recipes – “Umm, really…a whole 3 tbsp of what spice? Won’t that send the flavors completely off-kilter?” etc. You are pretty sure the man has finally lost it, or that his editors have made the ultimate typo. But as it turns out, you’re wrong. And when you sit down to the meal, you realize, for the hundredth time, that you should just blindly trust Yotam. So you can imagine the stars I had in my eyes when I actually spoke to the man in person last night (gushing stupidly, of course, while he signed my copy of his latest book) and listened in wide-eyed wonder as he regaled a packed auditorium with tales of his childhood and listed his new favorite ingredients. He was charming, personable, generous with his opinions, funny, humble…and brilliant. It was all I could do to not blush. Preheat oven to 350°F degrees. 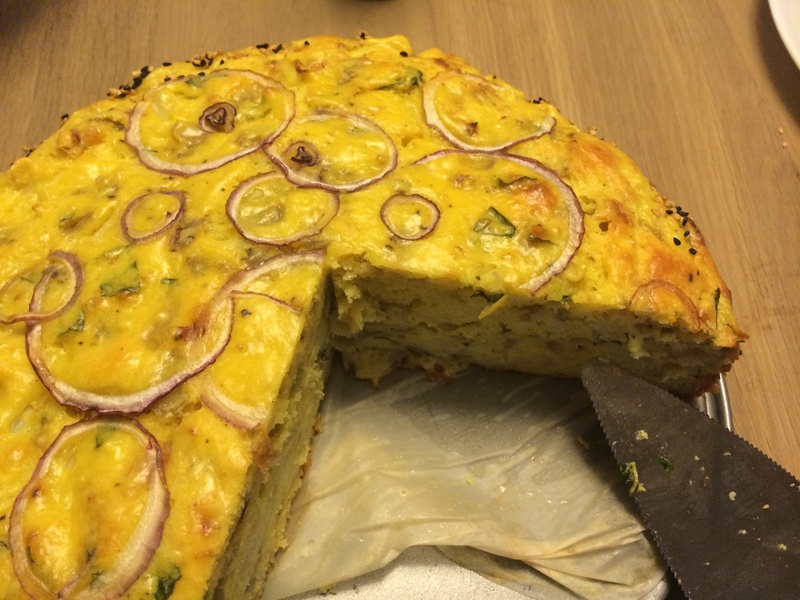 Break cauliflower into medium florets. Place florets in a pot with a teaspoon of salt, cover them with water and simmer for 15 to 20 minutes, until quite soft. Strain and let drip in the colander for a few minutes so they dry and cool. Meanwhile, prepare the batter. 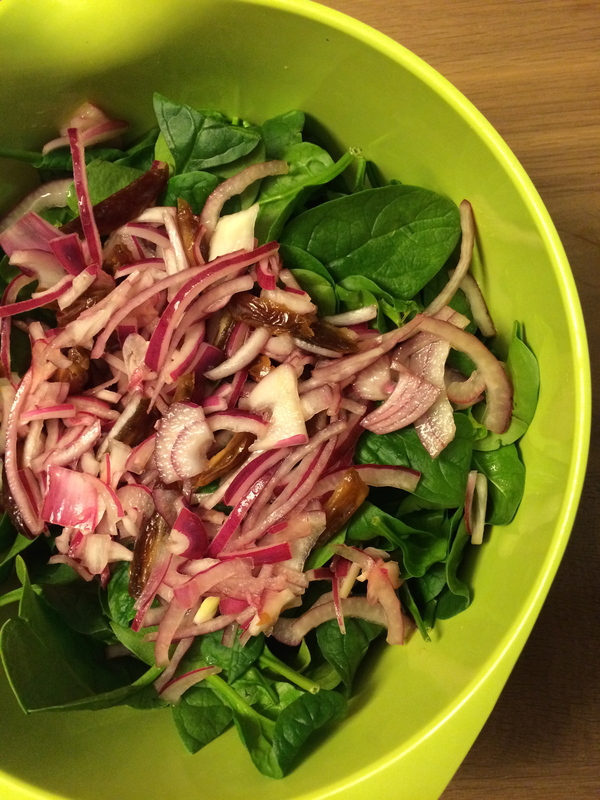 Halve your red onion and cut a few thin rings off the end of one side; set them aside. Coarsely chop the remainder of your onion. Heat all of your olive oil in a saucepan and saute the chopped red onion and rosemary together until soft, about 8 minutes. Remove from heat and allow to cool. Whisk eggs and olive oil and onion mixture together. Stir in basil. Whisk flour, baking powder, turmeric, cheese, 1 1/2 teaspoons salt and lots of ground black pepper together in a separate bowl and add to egg mixture, whisking to remove lumps. Stir in cauliflower gently, so most pieces remain intact. Line the bottom of a 9-inch round springform pan with parchment paper. Butter the sides generously. Put the sesame seeds in the pan and toss them around so that they stick to the sides. Pour in the cauliflower batter, arrange the reserved onion rings on top and bake cake in the center of the oven for 45 minutes, until golden brown and set. Let cool slightly before carefully removing from the pan. Serve warm or at room temperature. This is going to be a letdown right away – no, this isn’t a brunch cocktail. Sorry, guys. It is, however, one of the easiest and most delicious things you will put on your dinner table this week. It’s supposedly a side dish, but we ate it pretty much on its own, without saying two words to each other until the plate was clean. Straight from the serving platter, with our hands. Those forks I’d put on the side wound up being purely ornamental. The other perk here is that you can give yourself a pat on the back about making something fresh and seasonal. Chances are, the asparagus at your local market are at the cheapest and most plentiful they have been all year, practically begging you to take them home. Resist the urge to just steam them or roast them, even though I’m never one to scoff at roasting ANYTHING. 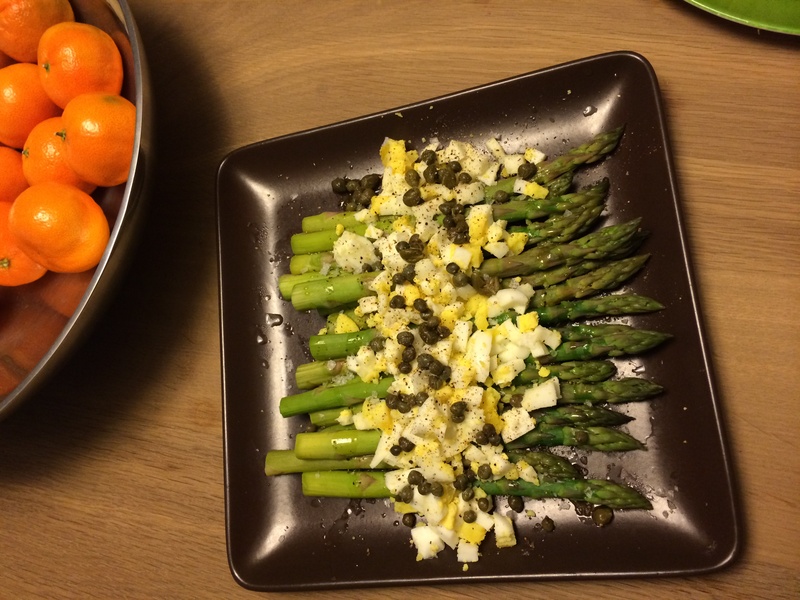 Instead, take an extra ten minutes to hard boil a couple of eggs and – voila, a way fancier interpretation of asparagus. Silverware optional. First, get your eggs ready. Cover the eggs in a small saucepan with cold water and bring just a boil. Turn off the heat, cover and set your timer for 10 minutes. Drain the eggs and transfer to a bowl of cold water for a few minutes before peeling. Chop the eggs finely. Using your hands, break off the tough, woody ends of the asparagus and discard. Set a medium saucepan of water over medium high heat. Once it comes to a good rolling boil, add salt and the asparagus spears. Cook for just a minute or two, until tender and bright green. Drain and arrange on a platter. Drizzle a tablespoon or two of olive oil over the asparagus. 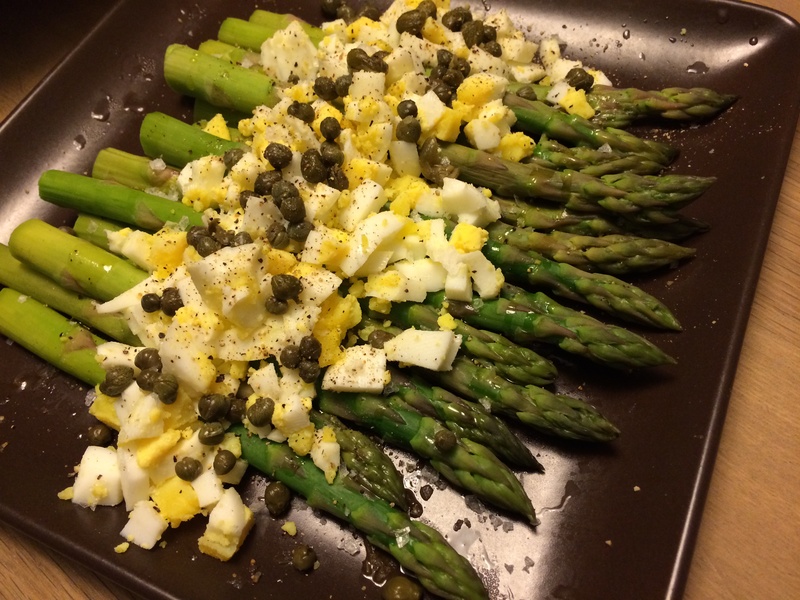 Top with the chopped eggs, capers and flaky sea salt. Drizzle a bit more oil on top. This spinach salad was one of my top 5 food discoveries of 2013. I usually reserve such strong praise for dishes that are much higher in fat (let’s be honest), but this salad has a way of being sneaky that way. It’s healthy and quick, but packs such an unusual taste punch that you’re pretty sure it must be more complicated than it seems. In truth, it’s just a few different elements that each receive a little extra attention. Put them all together and you have a killer salad, one that I could happily make an entire meal of. This recipe comes from Yotam Ottolenghi, whose London restaurants I have dreamed of visiting for years. His recipes are amazing, always boldly spiced, sometimes aggressively so, and hugely diverse in their inspiration. He is also one of the few chefs who not only gives vegetables their due, but isn’t afraid to put them at the center of the table, even though he isn’t a vegetarian himself. I can try his recipes with the confidence that the flavors will always be interesting and unusual – no lentil burgers here. This salad is from his wildly popular book, Jerusalem, which spotlights the delicious food of his native Israel. I pre-ordered the book way before its release, knowing that if anyone could help me relive my own time in Jerusalem and Tel Aviv, this was the man. And he delivered big time. This is a beautiful, beautiful book, full of recipe inspiration. Plenty of the recipes from it have entered into our regular meal rotation. But for now, spinach salad. An irresistible combo of sumac-coated pita bread, toasted almonds, vinegary onions, and sticky dates. Put the vinegar, onion, and dates in a small bowl. Add a pinch of salt and mix well with your hands. Leave to marinate for about 30 minutes to an hour. Meanwhile, heat the butter and half of the olive oil in a medium frying pan over medium heat. Add the pita and almonds and cook for about 5 minutes, stirring frequently, until the pita is crunchy and golden brown. Remove from the heat and mix in the sumac, red pepper flakes, and 1/4 teaspoon salt. Set aside to cool. 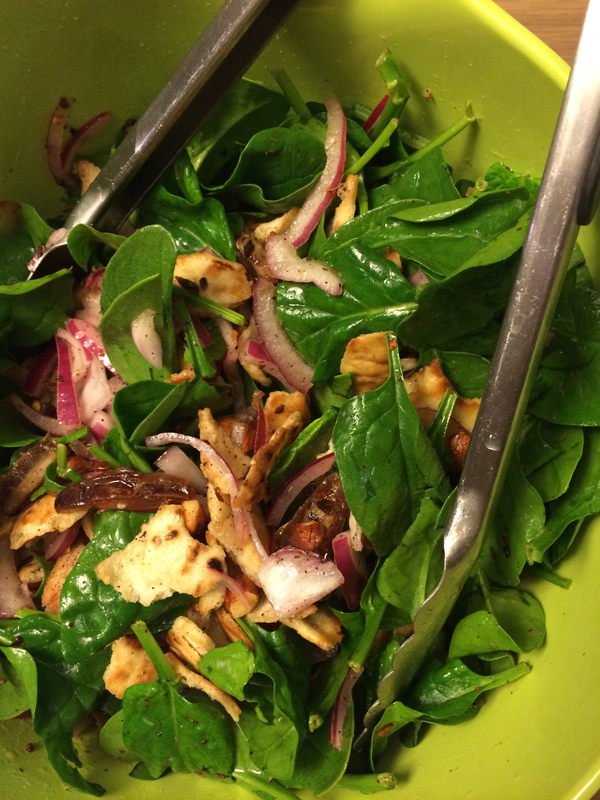 When you are ready to serve, toss the spinach leaves with the pita mix in a large mixing bowl. Add the dates and red onion, the remaining olive oil, the lemon juice, and another pinch of salt. Serve immediately.